Â Case Studies on Information Systems Security in Banks. Â Computer Crimes : Concept, Control and Prevention. Â Key to Successful Computerisation in Co-operative Banks. IT users are the victims of various IT related crimes, mostly unknowingly, due to intentional / unintentional crime committed by some people. 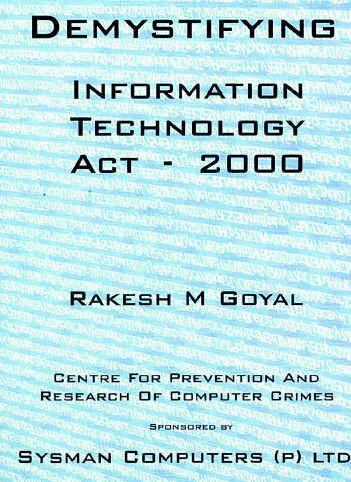 IT Act-2000 was enacted to provide legal protection from various types of Computer Crimes. Even after enactment of IT Act, most of the IT users does not know many of itâ€™s useful provisions to safeguard themselves and take advantage of these legal provisions. It is partly due to ignorance of the Act and partly due to legal vocabulary.Â Even, IT professionals are also not conversant with the law, which could easily push them within the ambit of the Act. In this book, I have tried to demystify the IT Act-2000. This book can be used as an Easy Guide or IT Act-Made Easy. The book explains the provisions of the Act in simple terms and help people to prevent trespassing the orbit of the Act. It provides practical insights into the provisions, penalties & punishments specified in the Act as well as - â€˜What care to take to protect us from provisions of the IT Actâ€™. â€˜Demystifying IT Act-2000â€™ is a valuable legal guide for all IT professionals, IT users, legal fraternity, judiciary, law-enforcers, students and teaching staff of law and IT colleges and also from the level of computer operators to the CEOs of all companies, interested in IT related legal implications. ALL YOU WANT TO KNOW ABOUT IT, BUT DON'T KNOW WHOM TO ASK! Electronic Banking, e-commerce, e-governance, online electronic trading and other electronic services are gradually becoming more popular and even essential. Indian Income Tax Department, Excise and Customs Department, Foreign Trade Directorate, etc. are insisting on filing e-returns. These e-services offer the convenience and flexibility of round-the-clock service direct from your office or home without using a single paper and without visiting the concerned government department or service provider in person. Similarly, authentic business dealings, correspondence, quotations, tenders and agreements can be done in real-time. This enhances the business scope, range, confidentiality and competitiveness manifold. However, the privacy and security are big preventive concerns in taking advantage of this new medium to do business. Digital Signatures is the technological and legal system, which provides authenticity, privacy and security to e-commerce, much more than paper based transactions. This book elucidates the Digital Signature process and technology along with legal issues involved. The book is written for the users of Digital Signatures for their easy understanding of the concepts and process of Digital Signatures in a simple language. The book is useful for businessmen, corporate executives, bankers, lawyers, academicians and students. The book is appreciated by some power users and they have expressed the opinion that they have got more insight in the concepts, usage and security involved in Digital Signatures. This monograph presents 24 case studies based on the actual experiences of Risk Management experts and IS Security Audit teams during their security assessment assignments in banks. 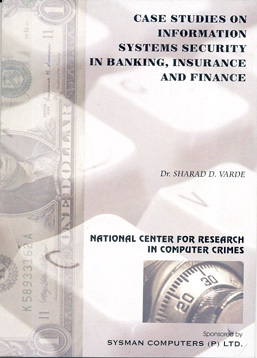 Large scale computerization of banking operations increases the risk of computer misuse, lapses, crimes and frauds. A bank fraud in a fully computerized environment can be several times larger than that in a fully manual set-up. Now, a bank can suffer irreparable damage if its IS security is jeopardized by imperfect software, substandard hardware, poor network or indifferent staff. Even technically best systems can cause disaster if handled poorly. Hence, this warning bell! These case studies can be used to inspire and imbibe IS security discipline in banks. They should be discussed in management committee meetings and training sessions at all levels of bank personnel. The regulators and directors of banks, IT experts, legal professionals, academicians and management students may also find them interesting. Top Banking Professionals of Reserve Bank of India, Commercial Banks, Development Banks and Co-operative Banks have appreciated the cause as well as the contents of this monograph. They feel that it will accelerate the process of enhancing the security of the information systems assets of the banking and finance sector. This monograph was released by Mr. Vepa Kamesam, Dy. Governor, Reserve Bank of India. The Information Revolution has revolutionised the world. We are in the era of Information Economy. Computers can make or mar any individual, business or organisation depending upon how they are used or misused. The victim of Computer misuse, fraud and crime are faced with irrecoverable losses. Computer Crimes are committed around us as frequently, as we breathe whether we know their presence and/or occurrence or whether we are effected by these or not. 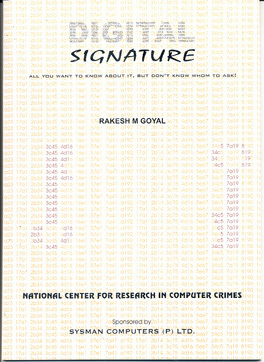 There are number of cases of Computer Crimes in India in the since 1992, where the authors were involved as investigators. Knowledge of Computer Crimes, their nature, characteristics, scope, causes, governing factors, potential perpetuators, recognising techniques, investigating techniques, preventive techniques can help in saving potential future losses or even existing unknown losses. The book is meant for Business owners / Managers, IS Professionals and users, Managers, Accountants, Academicians, Judicial and Legal Professionals, Law Enforcement Agencies, Students of Criminology, Decision and Policy Makers. The book makes special reference to Indian environment and is written in simple non-computer language for layman computer user, requires no knowledge of computers. Excellent Efforts, Full of examples, Justifiable price, Recommended to all â€“ Institution of Engineers Bulletin (Nov. 1993). Welcome to theworld of Computer Crimes in India. Propagating the need for greater vigilance against Computer Crimes â€“ Indian Express (18 Dec. 1993). Excellent jobin educating reader. Excellent starting point for CEOs, EDP Chiefs, Students, Auditors, CAs, Engineers and Bankers. Explains the genesis of Computer Crimes clearly â€“ Business India (20 Dec. 1993). Informative. Glued. I read the book in one sitting. â€“ Mr. Justice Srikrishna, Bombay High Court. Excellent â€“ Mr. Sharu Rangnekar â€“ Management Educator. Worth Reading â€“ Mr. G V Ramakrishna â€“ Ex. Chairman, SEBI. Chairman â€“ Disinvestment Commission. Interesting â€“ Dr. C Rangarajan â€“ Ex. Governor â€“ RBI; Governor â€“ Andhra Pradesh. Society must take advantage â€“ Mr. Shyamal Datta-gupta â€“ Ex. President, Bombay Productivity Council. Path Breaking â€“ A judge from Calcutta High Court. Thank you Mr. Goyal and Dr. Pawar â€“ A leading Chartered Accountant. Unique work of hard labour.. An eye opener â€“ A leading advocate of Supreme Court of India. A must for every modern day banker â€“ Chairperson of a bank. Re-examining our systems â€“ Chairperson of a Rs. 3 bn. Indian company. 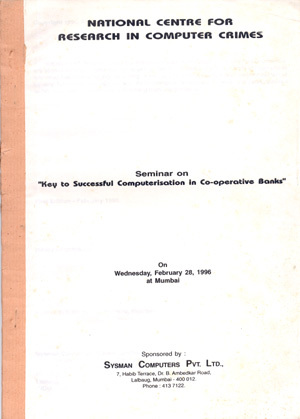 Key to Successful Computerisation in Co-operative Banks.